* KDE Plasma 5.13 is here. * Splitting up security projects. Arduino's cofounder describes the quest for simplicity. Systemd can start timers that automatically perform tasks at specified times. Graphical front ends make it easier to take full advantage of the Systemd process manager. We examine some leading tools for the KDE environment. 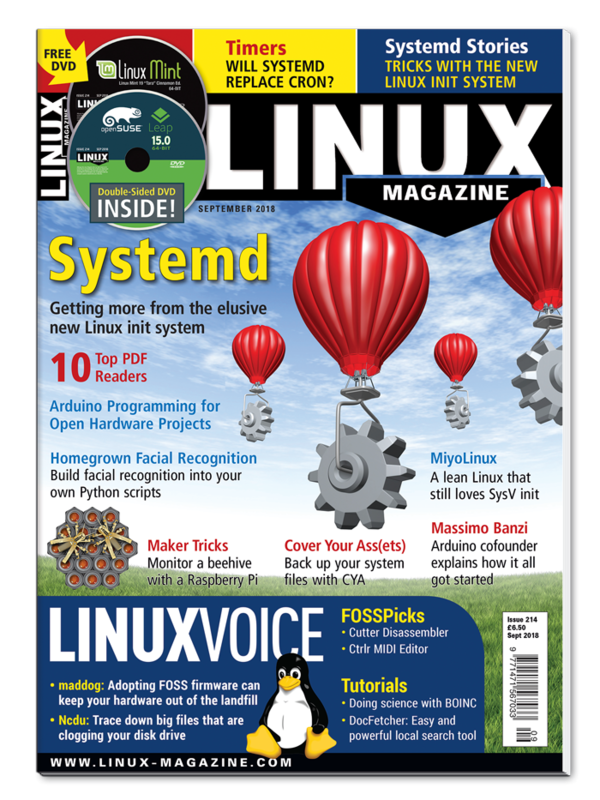 PDF readers are easy to find in the Linux space. We tested 10 candidates, including a few fast and minimal alternatives, as well as others that offer convenience and additional features. You can do more with the Bash history command than just using the arrow keys. We show you some tricks with Bash history. The pleasure of owning a nice domain like sensorenresidenz.de is clouded by the requirement of an X.509 certificate for every subdomain. It is not just Facebook – every Linux user can extract faces from photos and assign them to real people, thanks to free libraries. We show you how. Whether you are building your own device or customizing one, Arduino technology can function as the foundation for your open hardware project. Using a Raspberry Pi and various sensors, two hobby beekeepers monitor the temperature and humidity of their hives. Adopting FOSS firmware can keep your hardware out of the landfill.